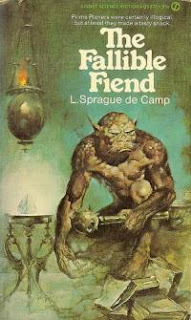 I recently had the opportunity to acquire and read L. Sprague de Camp's The Fallible Fiend (1972), and it's completely delightful; a real treasure and highly recommended. Of course, in Gygax's Appendix N, it's one of two works by de Camp called out by name (the other being Lest Darkness Fall). In terms of D&D, The Fallible Fiend falls into a category of possibly lesser-known works that are (a) great literature, and (b) loaned a few very critical ideas to the D&D game. Other examples would be: Bellairs' The Face in the Frost (on the profession of wizardry and spellcasting); Anderson's Three Hearts and Three Lions (alignment, paladins, trolls); and so forth. On the first day of the Month of the Crow, in the fifth year of King Tonio of Xylar (according to the Novarian calendar) I learnt that I had been drafted for a year's service on the Prime Plane, as those who dwell there vaingloriously call it. They refer to our plane as the Twelfth, whereas from our point of view, ours is the Prime Plane and theirs, the Twelfth. But, since this is the tale of my servitude on the plane wherof Novaria forms a part, I will employ their terms. This alone give us several central concepts to D&D: The idea of calling other dimensional spaces "Planes" (is it the first in pulp literature? Possibly so). The idea of the place of your origin being called the "Prime Plane". The fact that at least 12 such planes exist -- explaining my earlier mystification as to why, in Original D&D, the spell contact higher plane went up to exactly 12 planes (Vol-1, p. 29). Other now-familiar tropes to us also seem to come from the first chapter of this book, such as -- The powerful "demon" being something of a mundane citizen in his own realm. The need to give very precise, literal commands to avoid ironic downfalls by the creature (or a wish). The extradimensional creature returning to their own plane when they seem to be slain. And so forth. Moreover, I have to say that this slim little work of fantasy also provides an almost uncannily sharp cultural commentary for this exact time that we find ourselves in. The titular character is in all regards well-meaning, but subject to constant unwarranted abuse due to his strange appearance, language, and place of origin. We manage to follow him through a travelogue of various fantasy kingdoms, each of which has deeply insane customs -- but whose citizens are generally entirely convinced and willing to argue as to their rightness, in ways that are unsettling echoes of our own world. At a key point the Fiend meets with a crude and addlepated former entertainer (wrestler), who by a random electoral process has been named Archon of his nation, and has since let the country fall into complete ruin and anarchy. "We're not all thieves and murderers at heart," quotha. "In fact, most of us do be peaceable and orderly, asking only to be let alone to earn our livings." "But enough of you are of the other kind, if I may say so," I said. Rhuys sighed. "I fear me you are right. Do no demons ever misbehave?" "Oh, certes; but the fraction is small enough to be easily mastered. Besides, our wizards have puissant spells, which compel one accused of crime to speak the exact truth. This greatly simplifies the task of ascertaining the culprit's guilt." Rhuys looked sharply at me. "Does the Twelfth Plane permit immigration?" "I misdoubt the question has hitherto come up. When I return thither, I will try to learn and let you know." Prescient commentary indeed, for a work of pulp fiction. The book is not without its flaws: most notably, it has a rather obvious sexist blindspot. But the ending is as pitch-perfect as any I've seen in a fantasy novel. You should read The Fallible Fiend. Nice recommendation. I'll have to track it down. Admittedly I've explored little of deCamp due to his awful "posthumous collaboration" nonsense with Conan. This book, however, sounds very cool, a good way to pass a few hours over a couple evenings. I think it's great. Next up for me would be to get his Lest Darkness Fall, which is apparently also critically acclaimed. Thanks, Delta. Will keep an eye out for this one. I read the Compleat Enchanter collaboration with Pratt recently, which, yeah, sexist blindspot. But this does sound worth checking out. Speaking of 3H&3L, I suspect the swanmay came from there as well. While the swan maiden exists in older folklore (most notably the legends around Wayland Smith), the combination of other things being taken from the book and the description of swanmays leads me to believe 3H&3L was the primary influence on them. Sure, I totally agree with that. Whenever I comment on the things that were inspired by that book, I'm always torn about including swanmay in the list or not. It just seems a bit less prominent compared to the other giant ideas.